The four-decade-old quest for an independent and effective Lok Pal has entered a crucial phase once again with the tabling of the parliamentary standing committee’s report and its immediate rejection of it by the Anna Hazare-led section of civil society as a “dupe” played on the nation by the Congress-led UPA government. 17 of the 30 members of the parliament panel have reportedly given dissent notes to the version presented by Abhishek Manu Singhvi, whose late jurist-father L.M. Singhvi is believed to have coined the word “Lokpal”. And of the 24 issues concerning the bill, the members agreed on just 13 of them. Barring the creation of a Lok Pal, a cursory glance at the table above shows how little ground the standing committee found with the demands of Anna Hazare, who has twice sat on a fast-unto-death. Little wonder, the man from Ralegan Siddhi says the government has “fooled the people of India” even as he prepares to sit on a fresh fast. Questions: has the government fooled the people? Or is “Team Anna” stretching itself? Will a fresh agitation catch the people’s fancy again, or has the government discredited Arvind Kejriwal, Kiran Bedi, Prashant Bhushan and Shanti Bhushan enough to take the wind out of their sails? Will the parliament panel’s recommendations find favour with parliamentarians? Or is the Lok Pal bill likely to run into serious trouble with the Opposition? Also read: CHURUMURI POLL: Citizens above Parliament? Is the Indian Express now a pro-establishment paper? This entry was posted in Churumuri Poll, Issues and Ideas and tagged Abhishek Manu Singhvi, Anna Hazare, Arvind Kejriwal, Churumuri, Kiran Bedi, L.M. Singhvi, Mail Today, Prashant Bhushan, Sans Serif, Shanti Bhushan. Bookmark the permalink. Lok pal bill or Jan Lok pal bill or UPA Government’s concoction of a Bill by the name Strong and Effective Lok pal bill, the only thing an ordinary citizen like me would like to see is change in the delivery of services to the citizens without having to pay bribe. I began to take interest once Anna Hazare began leading a movement towards bringing about corruptionless governance. I learned that it was over 42 years since the first Anti-corruption bill was introduced in our parliament and nine such bills were introduced later. Now when these men began reaching out to the people and teaching the common man about the need to fight for rights, the government has moved deviously to prosecute its protagonists. I am beginning to suspect that those in power are fighting hard to ward off jail terms if not for themselves but for their dear benefactors. The UPA has been doing this in all fronts from the time they came to power. Not just fooled- DUPED! We the people of India deserve this as we forget all this for nothing! Growth and development have been stalled practically in all areas. No one seems responsible and has authority to revive the economy with realistic planning and imaginative strategies that can take people into confidence. We have a PM sitting screwed in the Ghadi, with some fake responsibility, but NO authority for anything. We have a FDI (Foreign Direct Individual) who seems to wield all the power and authority behind the curtain, but has NO responsibility or accountability. We have a Parliament whose average IQ level should be much much above average, and yet it is dysfunctional and a big drain on nation’s resources and tax payers burden. Probably, the Canteen in the parliament should be working overtime, again at tax payers cost because of feeding the useless guys called our representatives. Who you think is going to fight corruption? **TN wants to be assured to regular water supply from the dam to produce food, a sizeable portion obviously goes to Kerala to feed our friends over there. They seem to have plenty of money from Gulf and elsewhere, but short of essential food items. **Kerala fears the dam, being older than 100 yrs, might burst and destroy people and property (if this happens, I believe, people on both sides of the border will be affected). **TN remains adamant, based on the expert evaluation of engineers et al, that the dam is safe and can take more weight of concrete and sand to increase storage without any fear of bust. What should be the common sense argument, to resolve the issue without damage to public properties and peace. 1. We donot need to live with experts coming from faraway, but we are bound to live on both sides of the border (Kerala & TN) – so take the fear and concern of people seriously. 2. If Kerala can promise the quantum of water to TN not to be affected by the construction of a new dam, then sit with them and have the whole project implemented in a win-win situation. 3.Elevate people to higher level of understanding: water is God (or Allah or Jesus) given for humanity for proper CARING AND SHARING. 4. Let all of us think for a while: by fighting and dividing us in the name of state, language, religion, caste, community, etc. will make our lives futile and unworthy of humans of this great planet. UPA is morally bankrupt cabal, hoisted on the nation by a feudal congress, with a front man who is seen to be honest, but ineffective. I can almost visualize in him a Dritharashtra, who did nothing when Kauravas exceeded all Moral boundaries. At times I even wonder if our PM can even be called honest, when his less than honest acts have given us a questionable CVC, murderous police actions on peaceful protesters. There is a huge resentment against congress. The sad part is it is not channelized well by opposition. Should Opposition form a reasonable alliance, Congress will be reduced to double digits in next election. 1. Is the information conveyed by the statement: “17 of the 30 members of the parliament panel have reportedly given dissent notes”? Is it actually information or just noise? Have they dissented against the entire report or individuals points? For instance, Lalloo Yadav’s dissent is for a quota in the Lokpal. 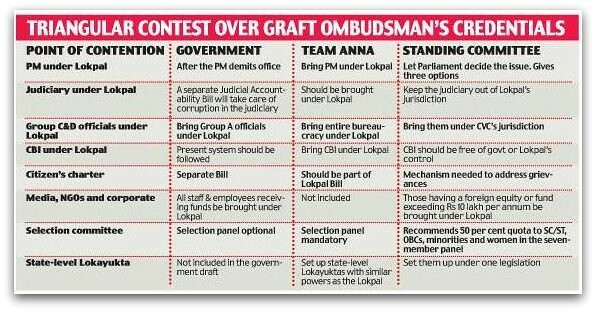 Natarajan’s and three other Cong MPs is for Group C employees to be brought under the Lokpal. 2. Was the parliamentary panel obliged to include Anna’s demands? 3. Aren’t there reasonable for-and-against arguments about each of the issues listed in the table? 4. Isn’t this how law-making is supposed to work? 5. What is the opinion of the 1.12 billion people of India on this? Can we say the report has fooled them all? Anna hazare and his team has to apologise to the entire nation for misleading it. He had promised in august that his was non-political, pro-people agitation, but after 3 months, true colour is emerging. Sharing the stage with bjp and company,the agitation has lost all credibility.inclusion of prime minister in lokpal will lead administrative paralysis,and may have internal security overhang. Anti-india forces may try to sabotage prime minister through misuse of lokpal. Team anna conviniently forgets about ngo corruption( bigger than 2g scam) ,corporate corruption. Manu singhvi and team consists of mp’s with great legal expertise, i support democracy over mobocracy by endorsing abhishek manu singhvi . Congress lead UPA was,is & will never be interested to introduce & get passed any such bill which could eradicate/reduce CORRUPTION as they are & will continue to be biggest corrupt & gainers of corruption.They are not only befooling people of India but have shown the AUKAT to Mammohan Singh & Pranam Babu. HAVE STANDING COMMITTEE OF CONGRESS & CO. NOT GROSSLY INSULTED BOTH HOUSES OF PARLIAMENT BY PRESENTING MINORITY REPORT TO CABINET ON ONE PERSON INSTRUCTION? My 11 year old son knows how to be (theoritically through his Civics lessons) MLA, MP, Minister, cheif minister, governor, prime Minister and president. Now he is asking me he wants to be part of lok pal when he grows up. What do i answer? Can Anna Hazare supporters help me answer this and give lok pal qualifications and requirements to my son. Tell him not to worry his little head about it. The selection panel will come to him. Let him concentrate on becoming an eminence in the meantime. A gem of a post :) – for both ideas and imagery.